Rush hit the jackpot back in 1981 with this classic album, now going 30 years strong. What accounts for its success could be explained by its synth flourishes and a focus on shorter than rather album side-length tracks, but it wasn’t like the band did a 180 stylistically or performance-wise, and drummer Neil Peart’s lyrics remain imaginative and conceptual as ever. Moving Pictures is still akin to progressive rock style but mainstream enough to appeal to casual listeners. Three of Moving Pictures songs still remain classic rock standards: the car-inspired “Red Barchetta,” the meditation on fame and success in “Limelight,” and the immortal “Tom Sawyer,” perhaps Rush’s most popular and familiar song. Not that the other four songs are window dressing: “YYZ” has this very “Bolero”-like feel to it, while the 11-minute “The Camera Eye” shows that the band still had a penchant for epic songs. 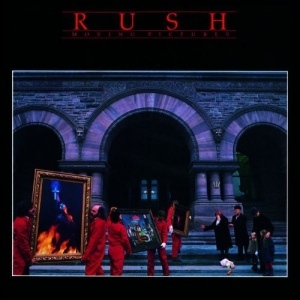 Moving Pictures is one of Rush’s best —it still sounds fresh and dynamic as ever. This 30th anniversary edition comes with a DVD of all the album’s songs in 5.1 surround sound as well as the videos for “Tom Sawyer,” “Limelight” and “Vital Signs,” previously unreleased, and liner notes by Rolling Stone’s David Fricke.